Kaci Heins, a fifth-grade teacher at The PEAK School, addresses her class on the first day of school on Aug. 19 (first picture). 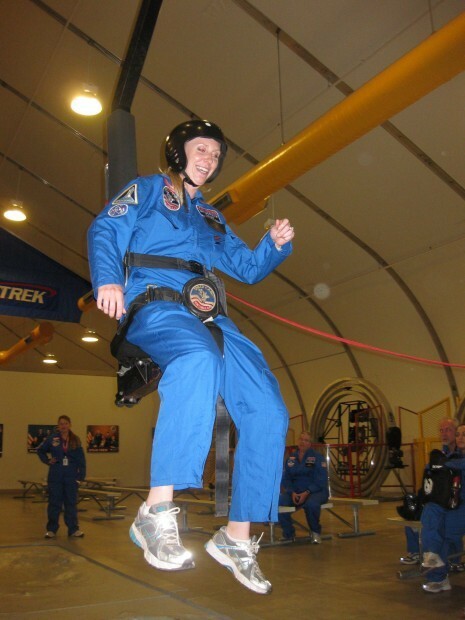 Heins attended the Space Academy for Educators this summer at the U.S. Space and Rocket Center in Huntsville, Ala., and brought back many space science, math and technology resources to share with her school. She was one of only 220 people picked from 39 countries. That's Heins again (second picture) getting a taste of an astronaut's life. The royal blue flight suit came home with her. This year, PEAK looks forward to monthly Parent-Teacher Group meetings in which students will present what they have been learning; parent-child activity nights in the areas of math and science; the "Pathfinder" Lego Robotics Team; and other fun activities. The school is also working on a collaboration to have students participate in monthly themed star parties at DeMiguel Elementary's Walker Observatory, and will begin dance rehearsals in September to take advantage of a dance grant from the Arizona Commission. PEAK is a tuition-free, K-8 charter school. To inquire about enrolling your child, call 779-0771. Original article on AZ Daily Sun website.